Proper flower care begins with the timing of your delivery. We recommend you schedule your lilies to arrive at least 4 or 5 days before the actual event. They need to "crack", open and bloom. For a Friday or Saturday wedding your flowers should be delivered on the Tuesday before. Normally they will arrive before 10:30 am, depending on your service area. Since your lilies will be shipped direct from the farms, you will be receiving them at the same stage as a flower wholesaler. So they will probably look different than you are used to purchasing. After they have been properly hydrated and put into a state of suspended animation, they ship in dry packs. It is NORMAL for your flowers to appear sleepy and thirsty on arrival. With proper care, they can last 7 to 10 days or more. A few hours after hydration, they will perk up and look dramatically different. You can speed up "cracking" by putting them near a window to get sunlight, but be careful you don't overdo it! You can also help open the blooms at the tip by slightly pulling them apart. 1. Carefully unpack lilies from box by cutting any straps. Remove packaging from the stems, but leave any plastic or paper covering the blooms for the first few hours while the flowers re-hydrate. Also leave the rubber bands holding the stems together for the first 4 hours or, if you wish, until you are ready to start arranging flowers. 5. Immediately after cutting, place the stems in the prepared water. The flowers will drink an exceptionally large amount of water upon arrival. Allow flowers at least 4 hours to hydrate well. Some flowers take up to 12 hours to hydrate fully. Lilies like to drink, so check the water level daily. IMPORTANT: Lilies have two parts to their stamen: the stalk and the anther. It is important for you to gently pull off the anthers from the stalk as the flower is opening. If you leave the anthers attached to the stalk, then a yellow pollen will appear. This yellow pollen will stain everything it touches! It will stain your hands, the flower, and clothing. If pollen stains your bloom, remove with a pipe cleaner. If pollen stains occur on clothing or material, remove with sticky tape (DO NOT APPLY WATER). 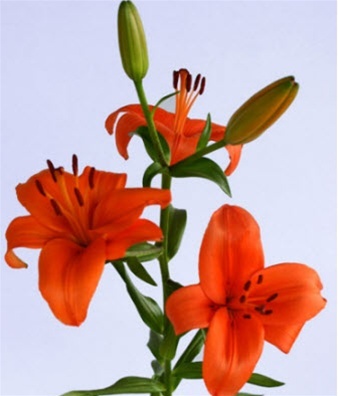 Lilies are sensitive to ethylene gas which comes from fresh vegetables and fruits, especially bananas. Please place lilies them away from or near fresh fruit and vegetables. GROWERS TIP FOR LILIES: After having your Lilies in a vase with water for approximately 1 day and you are ready for the blooms to open. Take the bloom and roll between your hands, applying LIGHT PRESSURE. (This is similar to rolling a pen between your hands.) You should continue to do this until you begin to see the bloom open. Once you see the slightest bit of the flower begin to open STOP rolling and leave the flower to open naturally. Schedule lilies to arrive at least 4 full days before your event so they have time to open. MyFlowerBuyer.com is not responsible for packages that are received before or after the specified delivery date, are lost, stolen or damaged once in the hands of the carrier. In the event that there is a delay with your package, please contact FedEx directly. Since Asiatic lilies are shipped closed, you should order them to arrive at least 4 full days before your event. Asiatic Lilies are shipped in 10-stem bunches, bundled together by a rubber band, packed in a cardboard or plastic wrap for protection. Each stem has 3 to 5 blooms that face upward from the center. Lilies carry a lot of pollen that may cause allergic reactions in some people. Expected minimum vase life is 8 days. Life expectancy is influenced by temperature. Cooler temperatures result in longer vase life. Colors may vary with climate, season and your monitor resolution. Lily - Asiatic - Asst.